My first trip was for two weeks in May 2011. 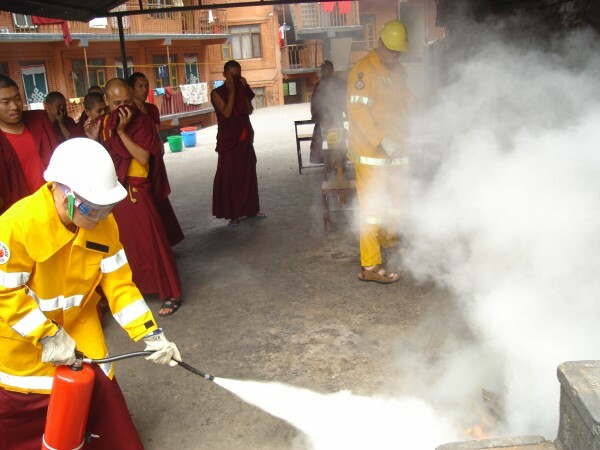 It resulted from hearing about a small fire in Lama Zopa Rinpoche’s suite at Kopan, which took place in early 2011. 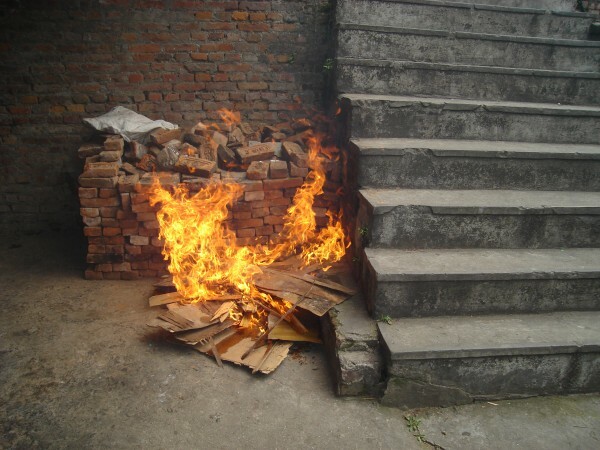 As a volunteer firefighter instructor, when I learned of it, I asked my wife Ingrid (who is also the Buddhist in our family), “I wonder how they put it out and if anyone was hurt?” We communicated with Ven. Fran [Mohoupt] at Kopan, and my two trips resulted from those conversations. 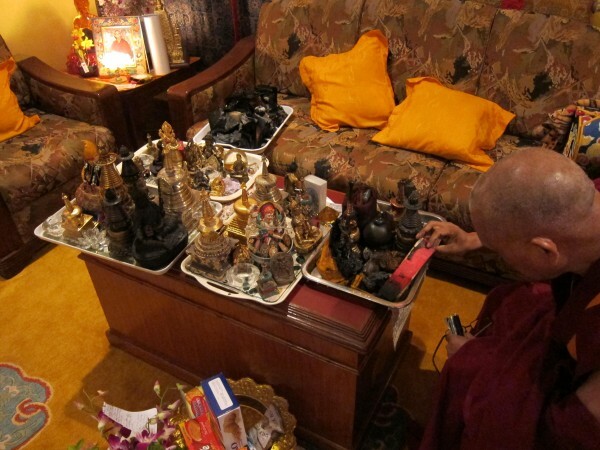 Rinpoche inspects the damage after a small fire in Lama Zopa Rinpoche’s suite at Kopan, which took place in early 2011. At both locations, I have also trained the monks and nuns fire teams in basic fire fighting and in offering first aid to the injured. On both trips, the members of the fire teams were keen to participate and learn the knowledge and skills being taught. Before leaving Kopan, I had a meeting with the managers of the monastery and the nunnery and they showed their commitment and support for the fire teams by agreeing to purchase some knapsacks, more gloves and torches, and boots and socks as it is dangerous to fight fires in sandals and so forth. They also agreed to provide secure areas for “fire stations,” where equipment can be stored, and have a dedicated area for on-going training. 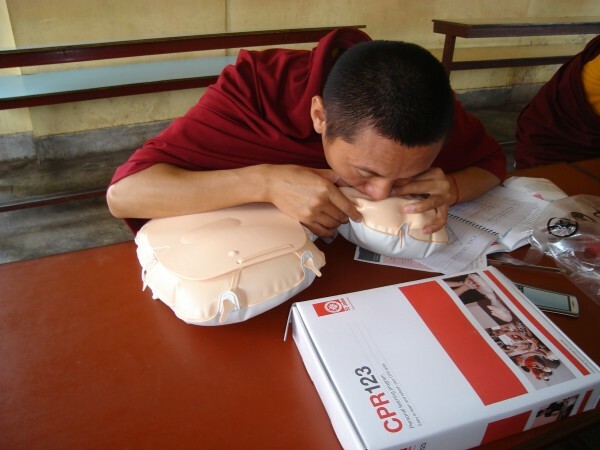 St. John Ambulance donated resuscitation dolls for CPR; first aid manuals and triangular bandages. Wormold Tyco Fire Equipment contributed some fire blankets and smoke detectors. Bunnings at Port Kennedy donated safety helmets and leather gloves. Accidental First Aid donated a large amount of first aid dressings and bandages which were given to the medical center at Kopan Monastery and an orphanage in Kathmandu. Safety Bay Chemist donated a large amount of Panamax tablets (analgesics) which were left for the monks and nuns. 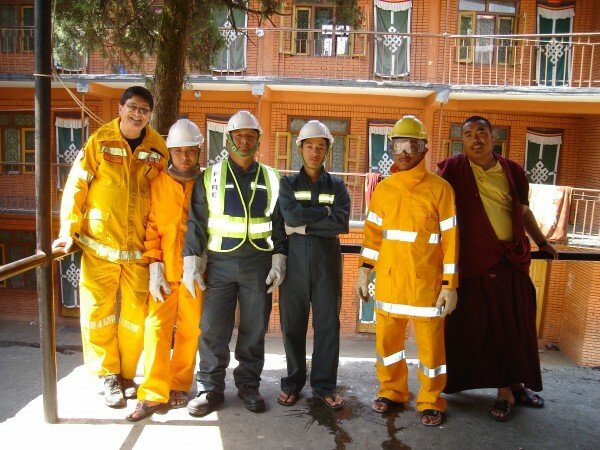 Stewart & Heaton donated Probane (fire resistant) overalls that have been issued to the fire teams at the monastery and nunnery. Staff at Singapore Airlines have been most generous in allowing me to have free excess luggage, allowing me to take the training and fire equipment to Kopan with minimal expense and to bring my personal fire gear home. Since arriving home, I have provided Kopan with a report of my visits and an on-going monthly training program for the fire teams. In addition to maintaining skills and knowledge for the fire teams, this will provide a basis for a risk management process. 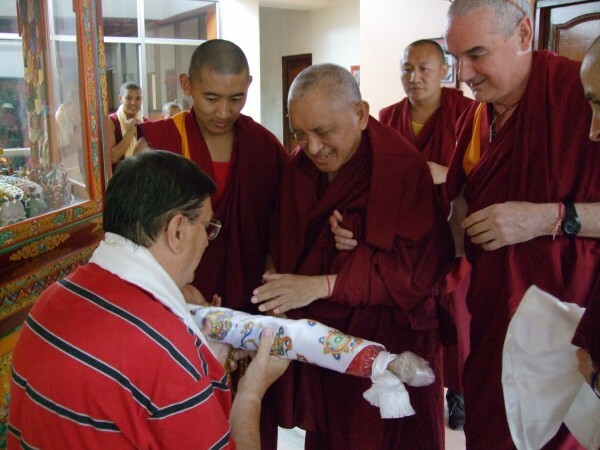 I feel very privileged to have had the opportunity to go to Kopan to promote the health and safety of the monks and nuns and to receive the blessings from the rinpoches. Please include fire fighters in your prayers that they may have the strength and courage to save life and property. Anthony (Tony) Vickery-Howe is a volunteer fire fighter instructor in the FESA Bushfire Service of Western Australia. He has recently received the Third Clasp for a National Medal which recognizes 45 years of volunteer fire and St. John Ambulance service. Tony and Ingrid have both retired from their careers in safety and mental health and are returning to Kopan in September 2012.